Shostakovich wrote his Symphony No. 13, Op. 113 in 1962. The climax of his 'Russian period' and, in its scoring for bass soloist, male chorus and orchestra, among the most Mussorgskian of his works, it attracted controversy through its settings of poems by Yevgeny Yevtushenko (the 'Russian Bob Dylan' of his day) not least the first movement, where the poet underlines the plight of Jews in Soviet society. The other movements are no less pertinent in their observations on the relationship between society and the individual. This is the final release in Vasily Petrenko's internationally acclaimed symphonic cycle. 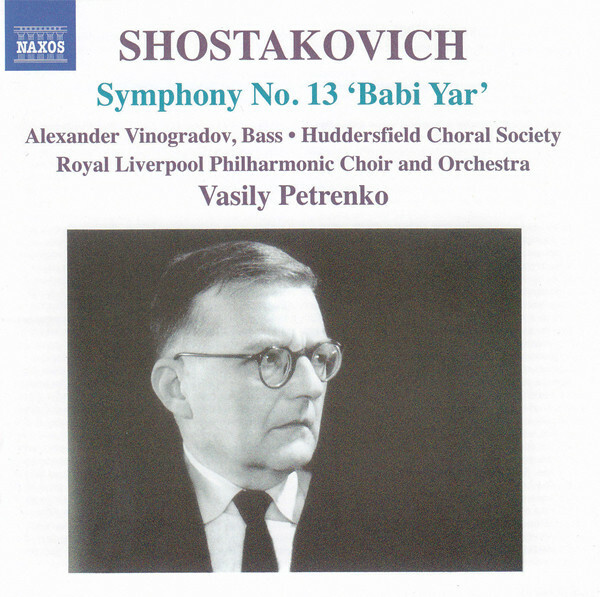 The cycle of Shostakovich symphonies from Britain's Royal Liverpool Philharmonic Orchestra under Russian conductor Vasily Petrenko has been widely praised, and this version of one of the composer's sharpest-edged works of protest will not disrupt the general trend. Here, as elsewhere, the reading is a sort of combination of British and Russian elements. The Huddersfield Choral Society probably does not have the sound Shostakovich imagined for this Mussorgskian work. But Petrenko catches the suppressed fury that often comes through only in Russian performances of Shostakovich. The work sets poems by Yevgeny Yevtushenko, a controversial enough move even during the cultural Thaw year of 1962. Each approaches the question of anti-Semitism in Russia through a different lens, and Petrenko is well acquainted with the moods of the work: the sharp satire, gathering anger, of the "Humor" movement (track 2), depicting the death of humor; the exquisite portrayal of Soviet drudgery in "At the Store" (track 3); the commemoration of the Nazi massacre at Babi Yar, Ukraine, aided by locals (track 1). Against the clear choral sound Petrenko sets a classic Russian bass, Alexander Vinogradov, with compelling results. A fine entry in Petrenko's series, worthy of standing beside his recording of the still grimmer Symphony No. 14, Op. 135.